Several years ago, I made these chicken, brown rice and cheese stuffed poblanos from leftovers and other ingredients I had on hand after discovering a new, amazing international market in our area called the Winchester Farmer’s Market. We thoroughly enjoyed the dish, but as is often the case with dishes I throw together, I didn’t write the recipe down. First, let me tell you about that amazing market! No one is quite sure why it’s called a “farmer’s market” as farmers do not have stands and directly sell their goods in the store. Not long ago, a second equally spectacular location opened and was named the Cordova Farmer’s Market. The first time you go to either store, you truly can not take it all in. Along with exotic produce from around the world, there is practically every ethnic ingredient you can dream of. The aisles are organized by country–need I say more? If you’re ever in the Memphis area and want to check them out, allow a good two to three hours to browse and “Google” ingredients. 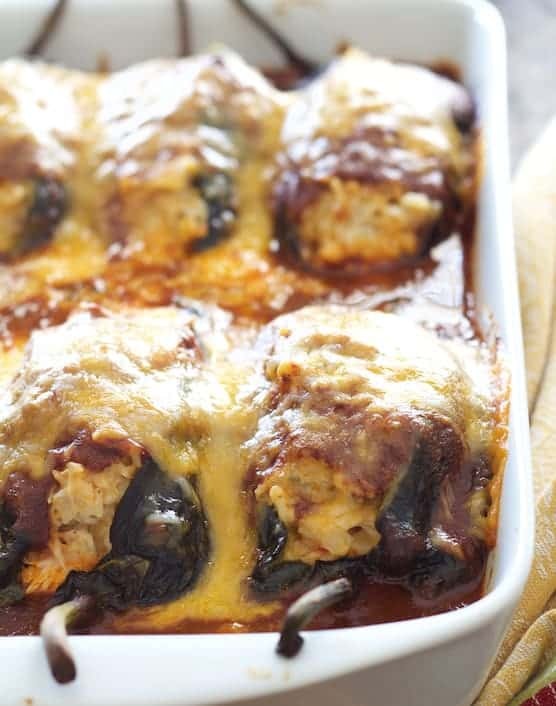 Now back to these amazing stuffed poblanos! 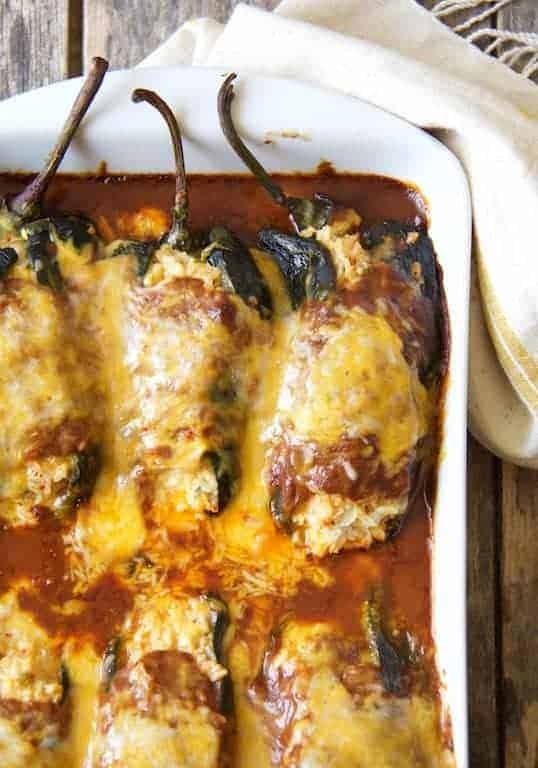 Chicken, brown rice and two types of cheese are enveloped in earthy, roasted Poblano peppers, topped with a red chile sauce and yes, more cheese! In fresh form, the chilies I used are called Poblanos. If you purchase them dried, they are called Ancho peppers. We love the deep, earthy flavor of Poblano peppers and grew them successfully a number of years ago. Most area grocery stores didn’t carry them when I discovered the Winchester Farmer’s Market. If I did find them elsewhere, they were often past their prime from not selling. So, when I saw a veritable mountain of these flavorful chilies there that were at the peak of freshness, I went a little crazy and bought a bagful. Last week I made another trip to the Winchester Farmer’s Market and another mountain of Poblanos called out to me. Time to recreate my stuffed poblanos! For this dish, you’ll want to remove as much of the waxy, papery skin as possible. To do that, roast them until charred, black and blistery. You can do this under a broiler, but you’ll need to keep a close eye on them. Instead, I roast them in a super-hot 450-degree oven close to the heating element (which in my oven is at the top). It takes a little longer, but I don’t have to watch them as closely. Turn them as necessary to char them evenly. You’ll see the skin start to pull away from the rest of the pepper. You could also hold them over an open gas flame, but that takes way too much time for me. Immediately upon removing from the oven, place a sheet of aluminum foil or another baking sheet over the peppers to enclose them. The steam generated while the peppers are enclosed helps to separate the skin from the flesh of the pepper so it can be removed easily. If a little stays behind, don’t sweat it. When peeling and removing the seeds, resist the urge to do it under running water. It might make it easier to get the seeds out, but you’ll be rinsing away flavor. If it tears slightly, don’t worry–you can wrap the pepper around the filling and no one will ever notice because of the sauce and cheese. Lighten them up by using all reduced-fat cheese or use less Mexican blend cheese in the chicken and brown rice mixture and less on top. For a vegetarian version, substitute black beans for the chicken and vegetable broth in the sauce. TO MAKE AHEAD: Can be made up to a day ahead and refrigerated. Cover tightly with aluminum foil. Increase baking time to 35 to 40 minutes. TO MAKE GLUTEN-FREE: Use cornstarch to thicken the sauce. I have to say I knew I would love this dish just by reading the recipe, and I was right, Absolute awesomeness! I see all of the dates from a couple of years ago and am sad it took me so long to find this recipe. I am also a huge soup fan. I had a lot of little poblano peppers that I had to pick before a frost, so I decided to turn this dish into a soup, it was the perfect soup for a cold evening! Love, Love, Love this recipe. Thank you for sharing! Hi, Kim, That is so totally creative– I love it! Thanks so much for sharing that idea! I made these tonight and they were delicious! My husband said they were certainly a “make it again” recipe. It took some time to roast and assemble everything, but it was worth it. I had some left over and really hope that they will reheat well for lunch this week. Thanks, Julie! Yeah, that authentic Southwestern / Mexican flavor doesn’t come easily, but in the end whenever I spend the time, I’m SOOOO glad I did! Thanks again and please stay in touch! THESE PEPPERS, indeed! <3 I absolutely love the sound of this combination, and I love how you used to grow poblanos for yourself because you couldn't find super fresh ones at the farmer's market. We've had good luck with poblanos, and I just saw some at the store today. I wish I'd purchased them because I would've totally made this for dinner tonight. Pinned and cannot wait to try this! This would be a perfect National Margarita Day dinner! Yum! OMG, when is National Margarita Day? Don’t want to miss that holiday! Carol these look simply delicious! I love the addition of cream cheese or ricotta vs. the standard cheese blends. Carol this looks so comforting and I love the combination of flavours- Yum! These look amazing! I love Poblano peppers as well and have started subbing them in recipes for Jalapeños, A deeper flavor without all the heat. 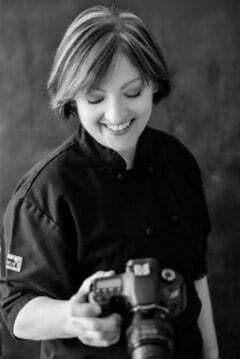 Great recipe …thanks for sharing!